What makes a great bowl of ramen? We dropped in on the ramen kings at Kanada-Ya to share a few bowls of broth and get their best tips and tricks for nailing those noodles. 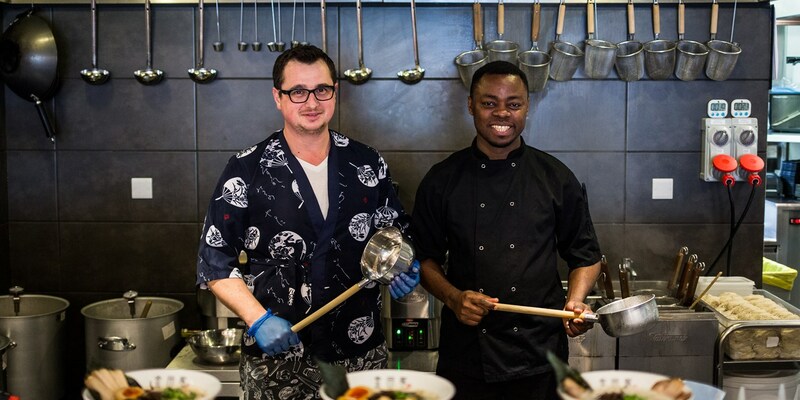 Ramen has hit the UK in a big way over the last decade. The ramen bandwagon went from nought to sixty awfully quickly – one minute we didn’t even know how to pronounce it, and the next, we were clambering over each other for bowls of soup and noodles. Of all the many ramen variations, it seems to be tonkotsu ramen that has captured our collective national hearts. This fatty, porcine broth originated in Fukuoka, Japan, but has spread like wildfire across the globe since. It’s no surprise that we’re so enamoured really – Brits have always been suckers for comfort food. 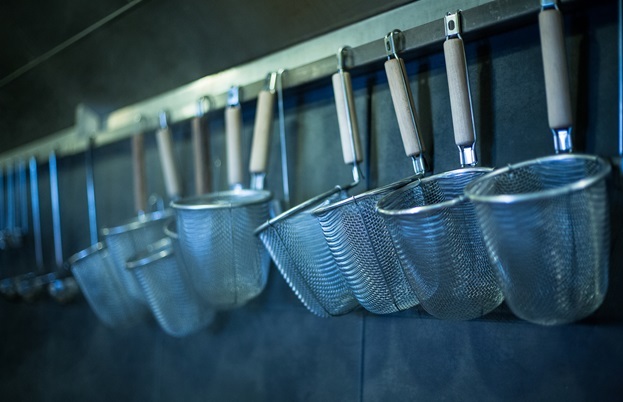 Just look at our culinary repertoire; roast chicken and potatoes; steak and kidney pudding; shepherd’s pie and countless others – all dishes that are designed with long winters, grey skies and frosty evenings in mind. 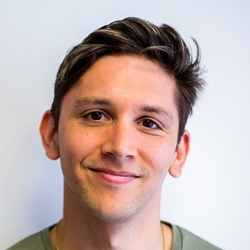 These days of course, Britain is a huge melting pot of cultures, and we’re just as likely to tuck into a good chicken curry, a plate of spaghetti bolognese or a mound of egg fried rice in a foil box. We’re connoisseurs when it comes to good comfort food, which is perhaps why we were so quick to take tonkotsu to our hearts when it first arrived on our shores. There are lots of places you can get a good bowl of ramen, but few inspire the dedication that Kanada-Ya does. Though the original site near Tottenham Court Road has been open for some years now, queues still snake out of the door and round the side of the restaurant, where hopeful punters take shelter under an awning and press their faces to the glass. It’s a beautiful marriage of cultures – delicious Japanese food meets peerless British queuing technique. 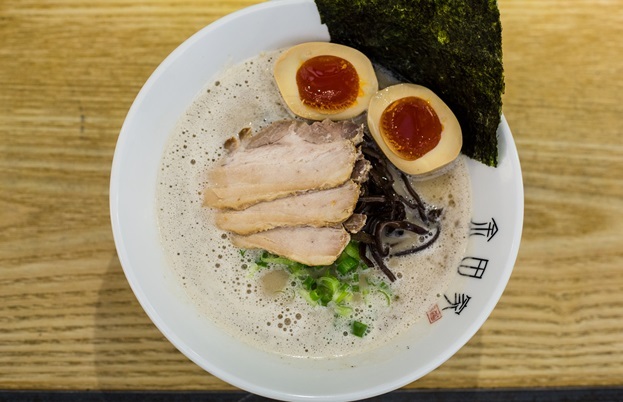 Thankfully, Kanada-ya have a couple of other outposts in London these days – one near Leicester Square and one at Angel, so you don’t have to stand around in the rain for your ramen fix. 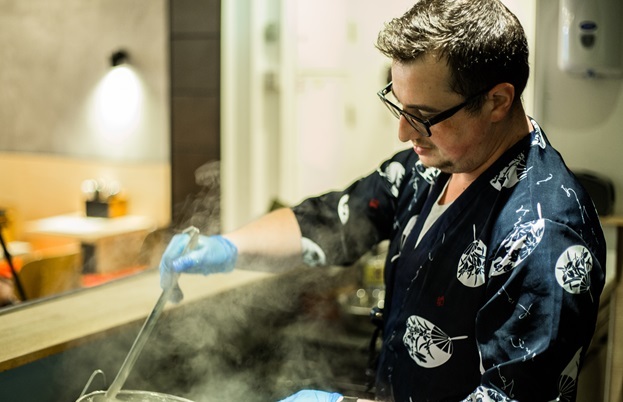 We dropped into the latter to get a few tips from the chefs about how to make a great bowl of ramen, and see if we could find out a few of their secrets. Of all the secret sauces and recipes at Kanada-ya, the tare is perhaps the most closely guarded, and that should give you an idea of how important the tare is to a really great bowl of ramen. 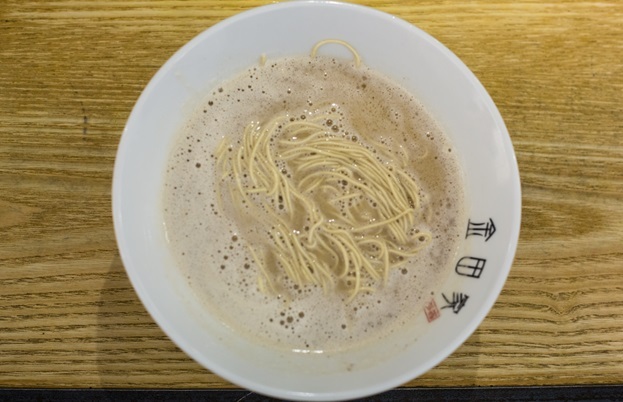 Tare is effectively the seasoning of the ramen – very little seasoning goes into the soup stock, so the tare defines the flavour of the ramen. Shio ramen for example, uses salt as its primary seasoning; shoyu ramen is predominantly soy-based; and miso ramen is, yep, seasoned with a miso tare. Tares have a primary ingredient, but are normally made with lots of other things that bring balance and depth. Mirin is a regular and important part of most tares – it adds gentle sweetness to your ramen. 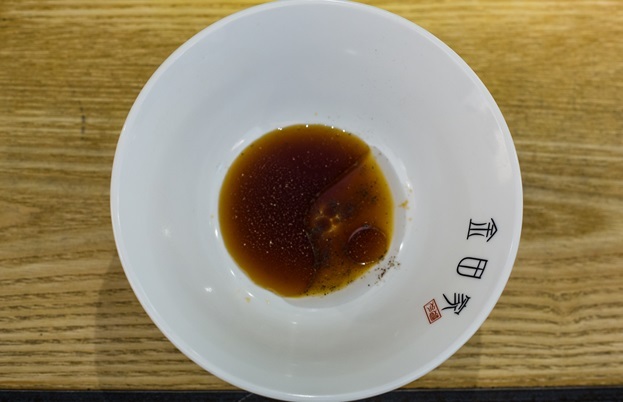 Vinegar is important too – especially in a tonkotsu ramen – to help cut through the richness of the broth. 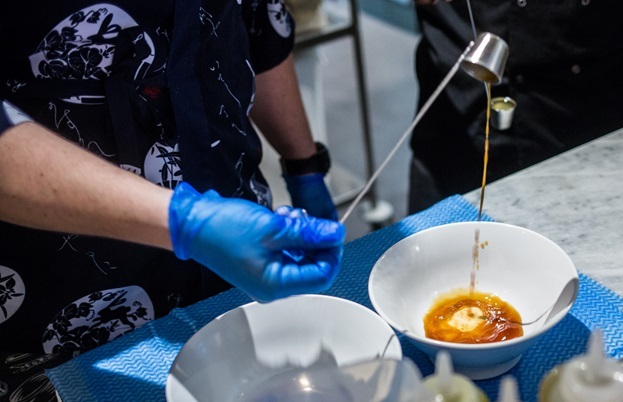 Try experimenting with different flavours – garlic, ginger, sake, dashi and the like – to bring balance to your ramen. Scour the internet and you’ll find all sorts of different tare recipes – the possibilities are endless here, so have fun with it! Though the immediate joy of tonkotsu is the bit where you shovel noodles and pork into your mouth, the broth is unquestionably the most important aspect of your bowl. The broth is the essence, the lifeblood of your ramen – it needs to have bags of flavour, and that sticky, gelatinous quality that makes tonkotsu so moreish. So, how do you make it? Well, they say that success ‘doesn’t happen overnight’, but in this case, it kind of does. Good ramen broth needs to boil for a long time – at Kanada-ya they boil their pork bones for forty-eight hours, allowing for the maximum extraction of flavour and texture. Forget your classic French stock-making technique, where bones are cooked at a gentle simmer to keep the stock crystal clear – tonkotsu broth needs to cook at a rolling boil from start to finish, to extract all the flavour and collagen from your pork bones. As the water churns, all those proteins and impurities dissolve into the liquid, making it cloudy and delicious, and probably an affront to French chefs everywhere; but that’s okay. Typical tonkotsu broth is made entirely with pork bones, but you can lighten things by using a mixture of pork and chicken; thus giving you a different flavour profile. 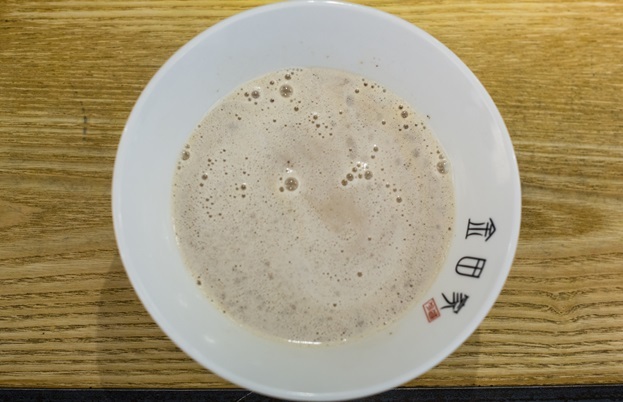 As for the rest of your ingredients, well, your guess is as good as ours – like many things at Kanada-Ya, the contents of their tonkotsu broth is a secret. 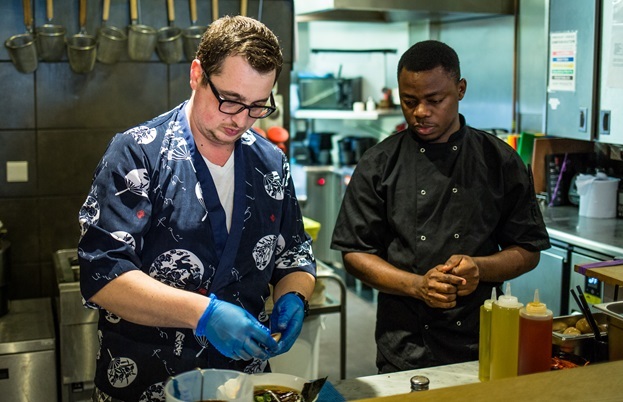 Here are a few tips though – you can use vegetables like onion, spring onion, garlic and ginger to add extra flavour to your broth, as well as ingredients like dried mushrooms, kombu (dried kelp) and bonito (dried fish) flakes to add umami and depth. 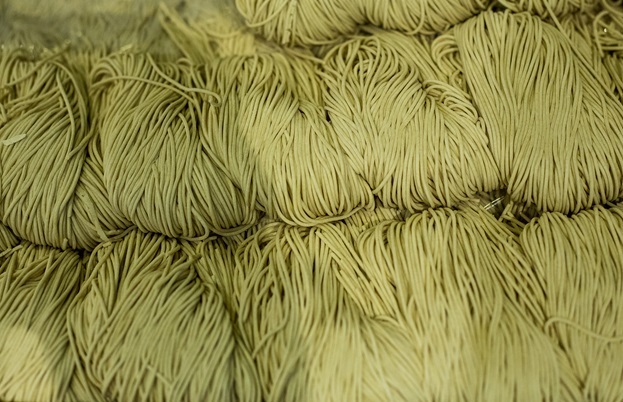 Pulling your own noodles is no mean feat – at Kanada-Ya they pull countless kilograms of noodles everyday, but it’s a huge undertaking. There are guides out there for ambitious home cooks, but pulling noodles is a skill that takes a huge amount of time and experience to get right, and you might be better off leaving it to the experts. You can buy good quality fresh ramen noodles in most Asian food stores and grocers, and even the dried ones are decent. The main thing to bear in mind is texture – as your noodles sit in the hot broth, they’ll continue cooking and absorbing liquid. Start with a completely cooked noodle, and they’ll be mushy and unpleasant by the end of your meal. To avoid this, make sure your noodles have plenty of bite when they go into your broth, and enjoy the slow evolution of texture as you descend into the depths of your bowl. 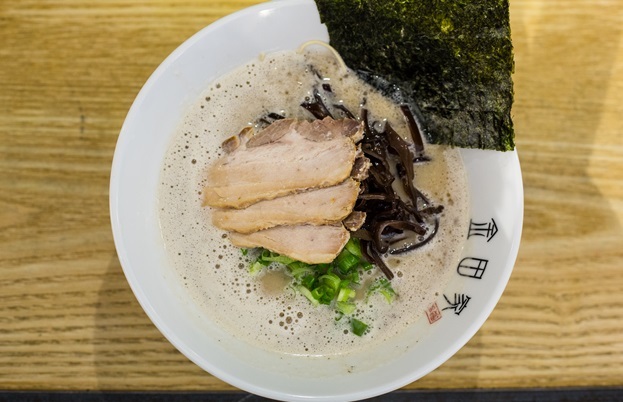 The tonkotsu at Kanada-Ya comes with three silky-soft slabs of chashu pork on the top – a delicious accompaniment to the rich broth and noodles. The recipe for their chashu is another of their closely guarded secrets, but the method is fairly standard and very achievable at home. Chashu pork tends to be made from pork belly, which is skinned and rolled before being braised in an umami-rich mixture of soy sauce, mirin, sake and sugar. You can lighten it with stock or water if you like, and most recipes add other aromatics like spring onion, garlic and ginger to amp up the flavour. Braise your pork in a low oven for a few hours until it’s meltingly soft, then let it cool in the liquid. You can press it if you like, or just slice it as is, and warm it with your broth before serving. An egg may be presented as an optional extra on the menu at Kanada-Ya, but as far as we’re concerned, you’re not having the true tonkotsu experience if you don’t have an egg on top. It might seem a complex thing, but cured eggs are actually very simple. Start off by boiling your egg – six minutes at a rolling boil should give you a soft-boiled egg with completely cooked egg white, but you can go an extra thirty seconds if you want something a little more gooey. When it’s cooked, plunge your egg into ice water to stop it cooking and shock the shell away from the membrane, making it easier to peel. Give it a bit of time to cool, then peel and submerge your egg in a chashu mixture, similar to the one you would cook your pork in. At Kanada-Ya they cure their eggs for a day or two before serving – the outside of the egg should take on a deep brown colour from the chashu cure. We could write a whole new piece about ramen accompaniments, but at Kanada-Ya, there are a few necessities. A handful of wood ear mushrooms adds a nice chewy texture and earthy flavour to the bowl. You’ll find dried wood ear mushrooms in most Asian food stores, but they might be called black fungus, or wood ear fungus – just rehydrate them using the instructions on the packet and warm them in the broth. Black garlic ‘mayu’ is also a must-try at Kanada-Ya. The chefs take garlic cloves and cook them in oil over a low heat until the garlic turns black, before allowing to cool and blending to create the mayu. On its own it can be a little acrid and bitter, but drizzled over the top of your bowl of ramen, it releases wonderful smoky garlic flavours and aromas. Finish the bowl with some finely sliced spring onions, a sheet of nori (dried seaweed, now often available in larger supermarkets) and there you have it – a blissful bowl of tonkotsu ramen, all of your own.